Make Your Own Extra Strength “No. 2 Spray” For The Bathroom! Jillee of One Good Thing decided to make a homemade version of “Poo-Pourri” which is a popular bathroom spray. She did some research and identified the three main essential oils in Poo-Pourri. Jillee’s spray is a mixture of water and the three essential oils in a 2 ounce spray bottle. How do you use it? You spritz it BEFORE you do your business. 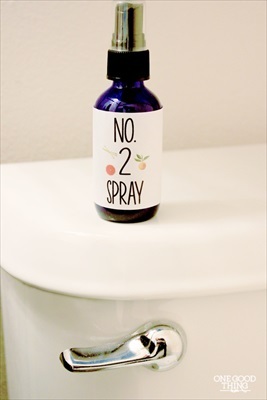 Just shake the bottle and spritz the #2 Spray into the toilet bowl. 3 or 4 spritzes. The oils spread on the water, create a vapor barrier and trap any offensive odors. Try it. It works!